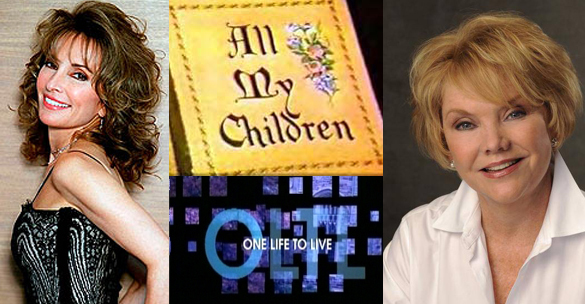 The recent shocking announcement that not one, but two classic, long-running Soap Operas, ABC’s “One Life To Live” and “All My Children,” had been cancelled sent shock waves through the entertainment community and all who have watched Soap Operas over the years. While I didn’t watch either of these shows (save for a brief time in the 90s when I watched “All My Children,” along with a few others), as a former dedicated Soap Opera fan, this stings. It stings about as much as it did when my favorite Soap, “Another World” was cancelled in 1999. And it surely stings as much as fans of the recently-cancelled “As The World Turns” (which I also watched for a few years in the mid-late 1990s) and “Guiding Light” felt when their favorite shows were ended. It seems the death knell has truly been sounded: Soap Operas, or Daytime Dramas– whatever you want to call them — are nearing the end of their lives. And no amount of trickery or black magic can possibly bring them back. Gone are the magical days of the 70s and 80s, when Soaps were required viewing for more than just the ‘typical’ housewife. My mom’s favorite shows were always on NBC: “Days of Our Lives,” “Another World,” “The Doctors,” “Somerset,” and “Texas.” I remember my mom and my Grandma, sitting in my Grandma’s kitchen, talking about the Soaps over cups of coffee, and discussing the lives of the residents of Salem and Bay City. The theme songs from those shows alone make me recall happy childhood days– about as much as “Sesame Street” clips and “Electric Company” sketches. When my family bought our first VCR, viewings of “Days of Our Lives,” “Another World” and “Santa Barbara” were part of our family time together. We all were engrossed by the stories, and loved zipping through the commercials to see what would happen next. As we grew older, we became part of the crowd of college students engrossed by the shows. When I visited my friends in college, entire dorms would gather to watch “Days” and other shows. It was just the thing to do. But time went on and attitudes and viewing habits changed. And now the Soaps are barely hanging on. They’re being killed by cheaper television: Talk shows, “Reality” shows, and “Lifestyle” programming. Shows that don’t need writers or actors. Shows that don’t need expensive sets or lengthy rehearsals and staging. Shows that don’t have legendary names like Susan Lucci, Erica Slezak, Anthony Geary and Victor Braeden. Actors on soaps spend the majority of their careers on the shows. The longevity is unheard of elsewhere in the industry, mainly because the fans of the genre become so attached to the characters they portray; and many of them stay in the roles for 30 years or more. Susan Lucci’s portrayal of Erica Kane has become legendary in the Soap world, representing the typical “so bad she’s good” character that audiences love to hate. She has spent practically her entire acting career on one show. There is really no place else where this kind of dedication and longevity exists in the entertainment world. Soaps have ridden quite a roller coaster over the years. From the early days of radio serials, to the first televised shows, which lasted for only 15 minutes each; to the boom of the 70’s where “Another World” actually expanded first to 60 minutes, then to an unprecedented 90 minutes; the stories, conflicts, dramas, trials and tribulations have kept viewers entranced. When I was a kid, the typical Soap Opera scene involved two ladies sitting in a kitchen set, drinking a cup of coffee and discussing their problems with each other. This changed when “Another World” started featuring love ‘triangles’ (Steve, Alice and Rachel) and the melodrama surrounding them. Then the first “Supercouple,” Anthony Geary’s Luke and Genie Francis‘ Laura from “General Hospital,” epitomized the 70’s and early 80’s fascination with daytime couples and their storylines, and propelled Soaps into the mainstream media, with appearances on Time Magazine‘s cover and major, expensive promotional budgets. And on “Days of Our Lives,” Marlena Evans Brady Black, was first possessed by the devil, then later bewilderingly killed off matriarch Alice Horton in 2003 during the controversial “Salem Stalker/Melaswen” storyline; which prompted fans to get so upset that they nearly boycotted the show — until it was revealed that she had been sent to an alternate universe with the other killed residents, and nobody was really dead after all. These are just examples of how entrenched in our minds these shows are, and always will be. I’m saddened to see that the genre seems to be dying. As our entertainment choices are further dictated by the Snookis, Real Housewives and gabfests of today, we’re slowly losing the culture that made TV what it was. Pretty sad. And my bed isn’t really my bed. Have a way of being true. And the things that I lose, I find. As Part 2 of my “Birthday Retrospective,” leading up to my 40th birthday, I’d like to take a look back at the music which shaped my childhood — which of course took place in the 1970s. Music was a big part of my childhood. It was ever-present, in the stereo in the living room, with its 8-Track player that we used constantly, and in my room with my own records. I lived through the singer-songwriter era, and the disco era. My mom clued me into artists such as Carpenters, ABBA, Barry Manilow, Barbra Streisand, Neil Diamond and countless others. If the 8-Track or the record player weren’t playing, the radio was. And I was singing along the whole time. By far, the Carpenters shaped my life the most, musically. They were a part of my earliest childhood, singing along with them to the “Singles” 8-Track constantly. I memorized the words to their songs just as quickly as “Twinkle Twinkle” or “Hickory Dickory Dock.” They’re ingrained into my fabric. And I wouldn’t have it any other way. To pick just one or two significant Carpenters songs is like trying to pick a speck of dust out of a pile of salt. There are so many that mean so much to me. But I did narrow it down to two. Written by Joe Raposo, writer of so many wonderful Sesame Street and Electric Company songs, this song probably means the most to me because it has, over the years, shaped my feeling about music, and has stayed with me ever since: Don’t worry that it’s not good enough for anyone else to hear. Just sing… sing a song. What a profound statement. Just like “Sing,” this Richard Carpenter/Jon Bettis classic quickly became my favorite, and even at the young age of a 3, I would sing it up and down the halls of my parents’ home. I called it “I Can Find” at the time, from the line “And the only explanation I can find….” in the chorus. I guess that one phrase stuck with me the most. In any case, “Top of the World” still remains a favorite, and every so often I listen to that recording me at 3 years of age, singing along with my Mom. Before Serial Mom killed one of her victims while playing “Daybreak” on her car stereo’s tape player (one of my favorite scenes, I must admit), this song reminded me of summers in the 70s, with Barry Manilow playing and my sister and I messing up my mother’s living room with Little People sets all over the place. Another favorite– again, trying to pick just one or two Barry Manilow songs proved difficult. All of the classic 70s tunes were part of the soundtrack of my childhood; but this one always stuck with me as a favorite. Even though he didn’t write it himself. (It was actually written and recorded by a singer named Scott English in 1971, and it was originally titled “Brandy.” The song’s name was changed when Manilow recorded it because another song named “Brandy (You’re a Fine Girl)” was popular at the time. These days, that notion seems ridiculous. Oh Dancing Queen, what a long history you and I have. You’d think it was the whole “gay” subtext that makes this one appropriate for my list, but you’d be wrong. It actually goes back as far as when the song itself actually first came out. My mom loved ABBA and had just about as many of their 8-Tracks as the Carpenters, and we played them just about as often. My most vivid memory of “Dancing Queen,” though, is that it always seemed to play on the radio while my mom was carting my sister and I to the KYF (which was more or less the YMCA in Kenosha) for swimming lessons. We’d both be miserable, dreading going to our lessons; but then ABBA would come on and we’d sing along with “Dancing Queen,” and everything seemed to be okay from there on out. So I guess a song can have multiple meanings to a person over the years. I don’t know what it is about this song, but it’s always been one of my favorite ABBA tunes. I like the story behind it, the melody, the bassline, and even the video. Interestingly, about this video, I remember seeing it on TV in the 1970s, probably on a “Midnight Special” show. You may remember that show– it was hosted by Wolfman Jack and featured popular acts playing live, and was shown, appropriately enough, at midnight. By the mid-1970s I was a pretty music-savvy kid, so if I knew one of my favorite artists was scheduled to appear somewhere, I’d make sure I saw it. ABBA was one of them. However, ABBA rarely appeared live, because they either couldn’t or weren’t willing to travel such long distances. So instead, they recorded short videos of themselves performing their songs. They were truly groundbreaking in the area of the short-form music video. No 1970s list would be complete without my namesake– well, at least my nickname’s namesake– the Rocket Man himself, Elton John. Elton was certainly present throughout my childhood, but he wasn’t among my parents’ 8-Tracks or LPs. Elton was someone I came to enjoy a little later on, when I realized just how much his music really had affected me. But I do distinctly remember Elton’s music being VERY present on the radio. Rocket Man was always a favorite. I loved the story of the song and the imagery employed by that awesome guitar effect of the “rocket taking off” as the song leads into the chorus. It was haunting and, really, groundbreaking– and it’s stayed with me my entire life. So much so that, when I first got online with the Prodigy service in the early 1990s, I chose Rocket Man as my online “handle.” And it’s stayed with me ever since. As you go through this list, you’ll see that singer/songwriters played as great a role in my musical heritage as rockers and disco artists. In fact, as I’ve grown older, singer/songwriters have probably had a larger lasting effect on me, both for the style of their music and the simplicity of it. James Taylor, by far, was one of my favorites. I heard “Fire and Rain” constantly on the radio growing up, and while I didn’t really understand what all the lyrics meant at time, I knew it was a wonderful song with a special meaning to someone. It’s still one of my all-time favorites today. I can’t help it. Whenever I hear this song, I think of Heinz ketchup. “Anticipation” was a mega hit for Carly Simon in the early 1970s, but many people my age will distinctly recall the Heinz ketchup commercials where two kids could barely wait for the ketchup to come out of the bottle. Of course now-a-days, you just squeeze the bottle and end of story– but if you are like me and like old-fashioned glass bottles, the “anticipation” is part of the fun. This song reminds me of a lot of things– it was on the radio constantly in the late 1970s, so there are many memories associated with it back then. But I also used this song for a slide show that I created for my DECA state officer team in the early 1990s. I wish I still had that slide show– might have to re-create it — but ever since then, this song makes me think of them. Two of Paul McCartney’s hits with his second band, “Wings” play very important parts of my childhood, and to this day I still associate them with specific moments from that time. This song reminds me of my mom and our neighbors taking us to the newly-opened city pool at the end of our block. When it first opened, they used to play music on the loudspeakers, and this song was among those played. For some reason, ever since then, I have associated it with that memory. It’s a very good memory, too. Simliarly, and much later in the decade, this classic tune reminds me of playing outdoors in the summer of 1978 or 1979. I had a little handheld radio then that I took with me everywhere I went, and this song was immensely popular at that time. Every time I hear it, I can see myself playing in the backyard and laying on our lawn chairs in the middle of the cool green grass. This song not only reminds of many wonderful times where I heard the song; but the lyrics of the song also evoke memories of the wonderful people that have come and gone in my lifetime. Nobody writes songs like this anymore. It’s a shame. When I was a kid, I went through a major country phase. I don’t remember exactly why– but I remember listening to country music on the radio a lot at one point. One of my favorite songs from that time was this gorgeous tune by the lovely Olivia Newton-John. This was, of course, pre-“Grease” and “Xanadu,” but I knew I liked what I heard right from the start. Another great song from her early years… this one always touched me as being so very honest. If you’ve ever seen her sing in person, you know how much she “lives” the song… she really interprets everything she does beautifully. Also, you’ll notice that all of these performances are LIVE. She rarely ever lip synched. Oh yeah, and autotune didn’t exist back then. This is called pure singing. I had to add one more, because Olivia is just so wonderful. This one is from just last year, in 2009. Not only is she still lovely, her voice has aged beautifully. As a singer, this is what I hope for — to grow old gracefully and to be able to sing for many more years to come. Now, no list of 70s artists from my childhood would be complete without the Bee Gees. In the mid to late 70s, they were EVERYTHING, and EVERYWHERE. I had their poster up in my bedroom, and wore their LPs out so badly I had to get new ones. The Bee Gees were quintissential 70s, and I still love them today. Of course, this song was a HUGE favorite of mine. When I got my “John Travolta Suit” for my birthday, I imagined myself on that lighted dancefloor, dancing to this song. Yeah… was there any wonder at all? Man, this song was smooth then and it’s smooth now. It never ages. One of the most perfect love songs ever written. And every time I hear it, I’m hurtled back 30 years to that time when I played it constantly on my turntable. Such great times. Such great memories. As a bonus, I have to include this classic 70s country-rock tune. This song was undoubtedly my favorite song growing up. It’s still at the top of my list. I never get tired of the melody and the story. And I was just talking to someone about this — when I would hear it back then, I would create my own “video” in my mind from the imagery of the story. I still think of those “images” today, every time I hear it. That’s the power of great music– timeless and everlasting. I love this live version, with an extended intro and solos at the end. Still makes me wistful today. As I grow ever nearer to my 40th birthday (less than a month away!) I decided it’s time to start taking a little trip down memory road and bring back some things I remember from my childhood. To start, I have assembled my Top 10 most memorable 1970’s commercials. Growing up as a child of the 1970’s, I was glued to the TV more often than not. So many of these commercials are just as memorable to me today as they were then. Oh how I loved this one. Something about it just stuck with me for years afterward. Maybe it was the way she said the commercial’s tagline, or maybe it was the thunder and lightning. Either way, I once in a while will still use this line. This is the only one I can find on YouTube— but I know many others were made. 9. Trix – Trix Ahoy! I used to always feel so sorry for the Trix Rabbit. Why were Trix just for kids anyway? After all, grown-ups could eat Trix if they wanted to– why couldn’t the rabbit? Anyway, his misadventures with trying to access Trix cereal were best in the 1970’s– when there were only three flavors: Raspberry Red, Lemon Yellow and Orange Orange. Of course, they always tasted the same to me. I think I went through at least 5 Slinkies in my lifetime. I always tried to get them to go down stairs but for some reason I never could do it successfully. That never stopped me from trying, obviously. I went through so many of them because I’d eventually get them all tangled and bent out of shape so they didn’t work anymore. I never got one of those plastic ones– I always wanted a shiny new metal one. Oddly enough, I STILL have the last Slinky I ever bought. It’s got to be over 25 years old by now, and it’s still in perfect condition. This one had major lasting power, running well into the 1980’s and possibly even the early 1990’s. It even had a resurgence when they found the original Mikey (who did not die from a mixture of pop rocks and Coke, as was greatly rumored) and brought him back for an update of the commercial in the 1980’s. I was just singing this to myself at the grocery store at the other day, when I was standing in a VERY long line waiting to be checked out. Next to me was the lunch meat, and a ton of Oscar Mayer Bologna. I haven’t eaten the stuff in years (the though sickens me– I ate enough of it as a kid, and frankly I never liked it then! ), but the song has never left my brain. If it has left yours, see how quickly you’ll recall it by clicking below. This one makes me warm and fuzzy inside every single time I hear the song. I remember KNOWING that Christmas was coming as soon as I heard this song play. I don’t know why, but it really affected me as a kid– and still does today. Another one that ran for YEARS, this one probably was viewed by me and my sister more times than any other. To this day, when I count to three, I say “One… Two-WHOOOO! Three!” As a bonus, I’m including the FULL version, where the boy asks a cow and a fox in addition to the turtle and the owl. The classic, long-running version just includes the turtle and the owl. What classic 1970’s list would be complete without this commercial? Even as a kid, I knew what a great commercial it was– if only for the song itself. I remember singing the complete, revised song in grade school around 4th grade or so. Of course, that was in the 1980’s, but that just goes to show the lasting power the commercial had. This one also ran for many years– and still makes reappearances now and then. It’s considered one of the greatest TV commercials of all-time. OK, I know that by today’s standards this commercial is TOTALLY un-PC. But any kid in the 1970’s knew the line “Ancient Chinese Secret, HUH?” Regardless of the message it portrays, it is a classic 1970’s commercial which ran for YEARS (well into the 1980’s, in fact). So it definitely belongs here! Chicago-based Tootsie Roll gets two entries in my Top 10 list. Both commercials had enormous lasting power (running well over 10 years each), and both were extremely effective because their messages were clear, clever and simple. This song is one of those that hurtles me back 35 years or so and plants me in front of the TV watching “Bozo’s Circus” or “Ray Rayner” on WGN Channel 9. I love this one. Last night I was tooling around YouTube, as I am oft to do, and I found this incredibly hot 70s slow jam that I’ve always loved. I’ve been kind of obsessed with it ever since. Gino Vannelli wasn’t a one-hit-wonder… he had a few hits in his day. But he proved to the world that Italian white boys can, indeed, crank out a hot slow jam. This video has it all: big– and I mean HUGE– hair, a smokin’ backup girl vocal group, cheesy camera angles, chest hair, a screaming crowd, and a tenor sax. I mean, does it really get better than this?